The Party Wall etc. 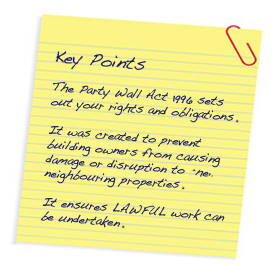 Act 1996 is the document which sets out a building owner’s rights and obligations when undertaking building works at their property. It was created in order to prevent the actions of the building owner from causing damage or disruption to their adjoining owners, while ensuring that they are not prevented from undertaking lawful work to their property. As you can imagine it is quite a lengthy document covering the legal requirements and procedures which must be followed before works can commence. 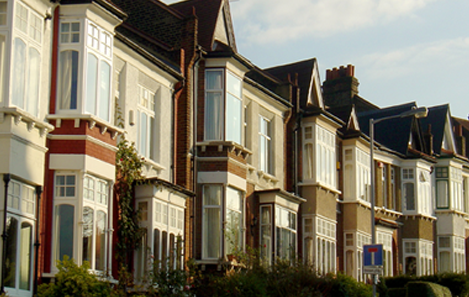 Our party wall surveyors are experts in their field, dealing with party wall matters on a daily basis. They are able to provide concise advice relating to your particular situation. Whether it is a simple single storey extension or a major construction project your appointed surveyor can fulfil all your obligations in relation to the Party Wall etc. Act 1996. You can proceed with the peace of mind that you have received the most up to date and accurate information possible. A Balanced Approach... At Adair Associates we offer full guidance on the extent and limitations of the respective owners' rights and obligations under the Act, helping to ensure a smooth and satisfactory outcome for all parties. In every appointment, Adair Associates acts with due care and in a general spirit of collaboration between the parties, liaising with the respective owners and appointed surveyors until an agreement is reached. Your appointed surveyor will undertake the co-ordination of all the paperwork, appointments and meetings required to facilitate this process. All of our party wall surveyors are members of the Pyramus & Thisbe Club, the organisation for party wall professionals.